I was up a bit late last night trying to finish these up – watch (well… listened to, mostly) Contagion and 12 Monkeys – how’s THAT for an evening’s double feature!? Contagion I hadn't seen before and I thought it was pretty good. 12 Monkeys I hadn't seen in years - probably over a decade and it was actually better than I remember it... You wont' read me write this often, but I actually liked Bruce Willis in it. I usually find him pretty dry - but maybe that's all just part of the tough guy part he's always pidgeon-holled into - but I thought he was actually quite good in 12 Monkeys. 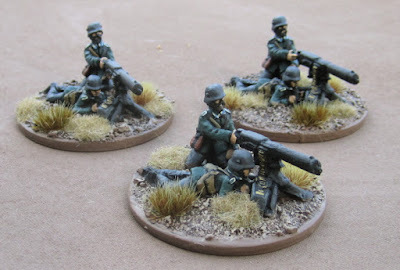 Machine-gun teams from Irregular Miniatures. Bavarian Reserve Infantry Regiments Nos. 1 & 3. These were part of the 1st Bavarian Reserve Infantry Division which held the southern end of the ridge. The 2nd Regiment, also part of the Division, held a part of the German line south of the Canadian area of operations during the Arras offensive. (I think it was the 51st Highland Division that was just south of the Canadian Corps, which would have been fighting against the 2nd). The mortar teams are from Renegade Miniatures, the machine-gun teams are from Irregular Miniatures, the rest are entirely homemade figures. Bavarian Reserve Infantry Regiments No. 3. On the bottoms of all of these Vimy figures I have stickers to indicate which unit each figure is in. Part of the reorganizing of the Germans I’ve been doing over the last week involved tearing the original stickers off and replacing them. 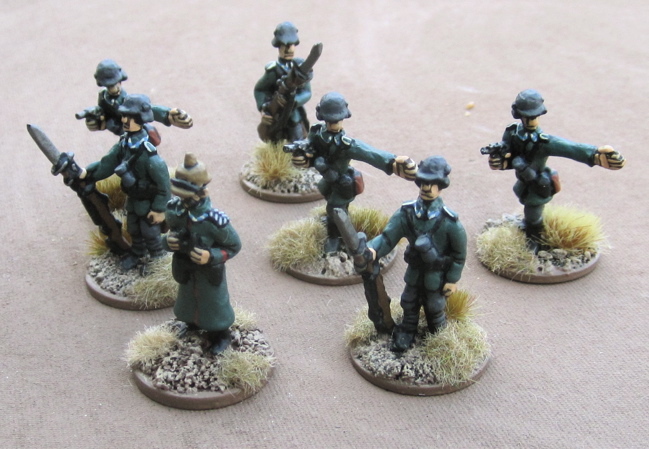 MORE Germans for the Vimy project. I had hoped to crank out another 45 guys to finish up the 79th Reserve Infantry Division… I probably won’t get them done by Sunday or Monday or whenever I get to the weekly countdown post. Tonight is our biweekly D&D night, but I should get in a couple of solid evenings of paiting Saturday and Sunday… So I should finish up the 262nd Reserve Infantry Regiment and get s good start on the 263rd. Then I have only a few spare battalions that were thrown in from the reserves to finish up for the Germans. Wow! You are really cranking them out now. I'm celebrating finishing my 2mm ACW. Photographing them outside was out of the question because they would have been quickly buried by snow and thus lost for at least a month. So I had to settle for photos in the basement shot with the light of a single bulb plus the flash. Still, the pictures look pretty good and I'm jazzed by how well the figures turned out. Thanks! The ACW stuff looks fabulous. I love the look of micro stuff for big, big battles... Probably the way I should have gone for this project... but I do like painting the bigger toys. I loved the result and I'm happy I painted them, but I think I won't paint any more 2mm. I have a tonne of micro armour to do and I'm not sure I am up for it. Probably I should do some 28mm terrain as a change. They look great as always...nicely done. Have to admit, I was a big fan of 12 Monkeys when it came out...saw it recently as well, still love it. It was definitely a change for Bruce Willis from his Die Hard days...and Brad Pitt was outstanding...although, not sure if he was acting insane or just ran with his mood at the time. Sorry I didn't respond to your email - I thought I had, but it was a busy week. I can't remember the last count, but it was enough that I figured I would go ahead with it. I do hope you'll be able to make it. Countdown to Vimy – 6 weeks to go! Countdown to Vimy – (Less than) 7 weeks to go! Countdown to Vimy – 8 weeks to go! Countdown to Vimy – 9 weeks to go!